The Pace of your life is perfect. You are being called to empowered expansion in every moment and in ways that are unique to you. In one moment it may feel like support, in another moment it may feel like opposition, yet each moment is nurturing your expansion in perfect ways. 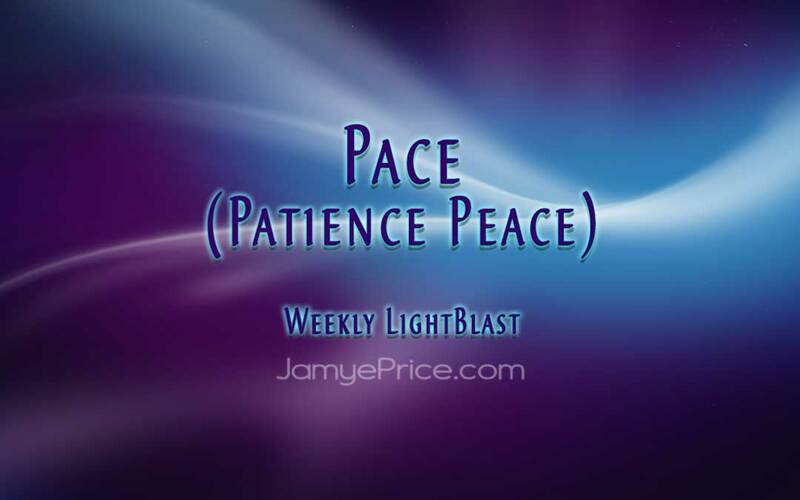 As you relax into the Pace, you actually speed your progress and enhance your creative peace. Patience, that virtuous challenge, is your gracious host. You are a being of movement, it is the “be-ing” in you. Being is a constant state of movement and change, and change is constant on Earth. Pace, then—movement, is guaranteed. You can not separate being and doing, for you are always changing. You can “do” without awareness, but you are still “being” in that moment, even if you are being unaware. As you surrender to the Pace of your Life, you open your awareness. Slowly at first, that is the natural Pace. Then you start to hear, see and receive the clues of Life that are showing you your path of empowerment. These communications were always there, you just didn’t notice them when you were busy doing without awareness to your surroundings. When you are playing loud music, just like thinking “loud” thoughts or feeling “loud'”emotions, you are unable to hear the gentle voice of Love that whispers to you from all aspects of Life. The flower gently shows you the courage of vulnerability. The child easily shows you the joy of play. The water bubbles the ease of the flow. The wind whispers the cool breeze of Life providing for you at every breath. The lilies do not toil, for toiling does not change them. They relax into the Pace of Life. You have a different path and Pace than a lily, but nature is working just as well to support your growth. You will be called into movement when your action serves your growth, you will be called into rest when your ebb serves your flow. Your patience opens your flow to the peace that passes all understanding; creating a Pace of movement that is not stopped by the unknown, it is not restricted by fear and it is not limited by the past. Your Pace, your patience, is your peace. Open your heart and mind to the perfection of challenge and ease. You will find that Life offers you both as appropriate and you are capable of opening to either. Challenge is a moment of change resisted. Ease is a moment of change flowing gracefully. They are as inseparable as being and doing, merely a difference of awareness. In the midst of challenge, your awareness of the movement of time, the value of choice and the possibilities that Life is calling you toward serve your peace, which serves your Pace. As we sit to Blast Pace, we are opening to the flow of Life with the understanding that challenge or ease is the perfect formula for movement in a moment. We are peaceful with the unknown, for it is revealing itself in ways that are ideal for the greatest unfolding of Life. We are slowing down to receive more of Life’s natural beauty and marching onward when Life calls us to new fields of focus. We understand the grace of Love’s compelling, for it changes Life on such deep levels, they are not visible at first. We are showing what being patient is doing to change this world at a rapid Pace. Blast on!